The other weekend, I had the opportunity to go watch Elysium after much deliberation about what movie to go see with my parents. Apparently we chose the wrong time of summer to go watch a movie because not a lot of blockbuster hits are out right now? And my parents weren’t at all interested in watching Disney’s Planes, much to my dismay as an aerospace engineering nerd. 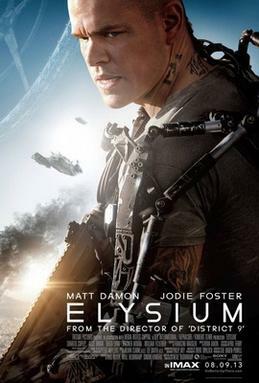 Elysium tells the story of one man’s desire to go to Elysium, which is a futuristic, space habitat orbiting the Earth. The setting of the story is in the far future, year 2154, where the poor and less fortunate live on Earth, and the rich and privileged live on Elysium. To further emphasize that difference in wealth and living, the citizens of Elysium have access to wondrous technology, and guard it very closely. They live a luxurious, comfortable life whereas the people on Earth live a rougher life without access to the most advanced technology. And I’ll leave it at that so as not to spoil the story. Perhaps I’m just turning into a Catholic nerd, but I find it interesting to pick up on the use of anything Catholic in Hollywood movies recently. I’ve seen hints of Catholicism either be part of the story or make a cameo in some movies like Skyfall, The Avengers, Les Miserables (ok, Catholicism really oozes out of this one), For Greater Glory, The Hobbit, etc. just to name a few. In Elysium, I definitely picked up on the religious sister seen at the beginning of the movie. She plays a role in the main character’s life and is the vehicle to present the “overall theme” of Elysium’s story (though I would say not as effective as it could have been, but this is not a review). Seeing her against the setting of this futuristic world in Elysium provides a visual example of a reality that unfolds here in real life, beyond the silver screen, by the Catholic Church. And it kind of struck me in a way that helps me better fully appreciate my faith. In the context of Elysium, the fact that it is set in the far future and that a religious sister is present shows that the Church will still be around. Even if we, all humanity, endure through tough times, the Church will still have a presence here on earth. In the real world, deeper study into the history of Catholicism shows that we’ve been around for the past ~2000 years (since the time of Christ), and what’s another 2000 more? Just as we’ve seen many changes throughout the course of human history in the best of times and worst of times, the Church has been present. Cool stuff! Perhaps as long as there are humans walking around this earth and/or floating in space, there will be the Catholic Church on earth until the end of the age. Secondly, not only did I see a religious sister present in the movie, but it is obvious in the context of the story that she looked after orphans. In reality, I find it easy to associate religious with works of charity and service to others. Religious brothers and sisters take those vows of poverty, chastity, and obedience. I see many communities that also run apostolates and have certain charisms like running schools, hospitals, orphanages, crisis pregnancy centers, homeless outreach, media, and countless other ways to reach out to others. Also, the religious sister in Elysium was appropriately seen on Earth, where the poorer people and less fortunate live and not on Elysium where the privileged and elite reside. This further illustrates how, in reality, religious communities are more frequently found in poorer areas helping the poor. Lastly, the religious sister says a line that seems to be one of the main themes of the movie. She says something to the effect of “never forget where you come from.” This is important to the movie because of the main character’s trying journey to Elysium. And I wish I could say more but that would spoil the story! In the real world, seeing a religious brother or sister becomes a sort of reminder for me that there is a God and that their life is a visible sign of what it means to know, love, and serve the Lord. Seeing them reminds me of where I come from–I come from God, created in His image and likeness. And as a response to His love and commands, there is a Church comprised of His Body. These are the Christians, specifically Catholics. Seeing that religious sister in the movie reminds me that I’m Catholic, and that I shouldn’t forget that I belong to God and His bride, the Church. I find it interesting to gain better appreciation of my faith through cinema. Despite Elysium’s shortcomings in plot development, it had cool visuals and action in addition to the presence of a religious sister that helped me better appreciate my faith. I only wish her dialogue involved any God-centered words, but I suppose her simple inclusion was enough for me.